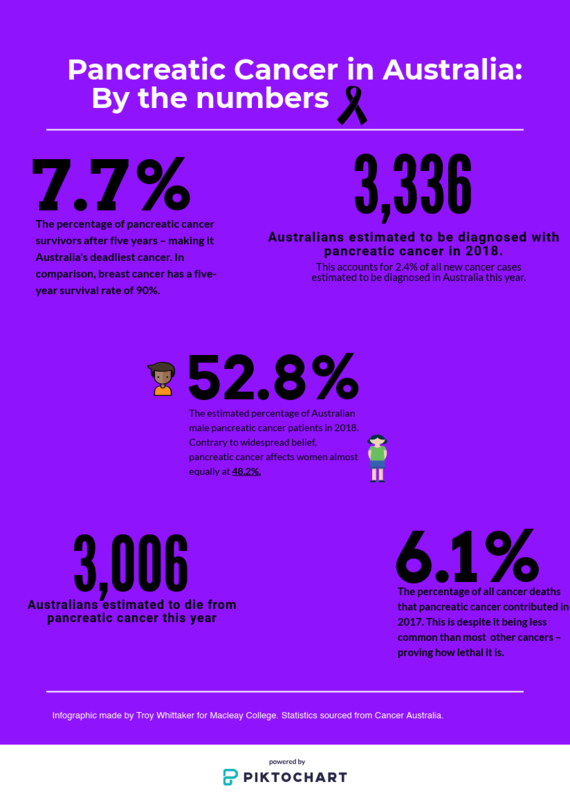 Pancreatic cancer is one of Australia’s deadliest diseases. More than 3,000 people are diagnosed with it every year. Most die within months. Megan Barnes remembers her father, Brian Jones, as a picture of health at 77 years old. Mr Jones was a fitness fanatic who hardly drank alcohol and didn’t smoke. A former second-grade rugby league player for the Newtown Jets, he continued playing representative touch football until his late 50s and enjoyed bike riding and a morning swim. He was in impeccable shape. But without warning, he found himself in an agonising struggle – one that claimed his life within four months. Mr Jones was taken by pancreatic cancer in May 2012. It’s Australia’s deadliest cancer, with a five-year survival rate of just 7.7 per cent. His family – including Ms Barnes, her husband and three children – were left shocked and broken. What they found most confusing and unfair, was the fact that the symptoms of pancreatic cancer weren’t recognised until it was far too late. Mr Jones experienced rapid weight loss, heartburn and back pain – all symptoms of the disease – but even his local General Practitioner thought his sickness was due to old age. He couldn’t have been further off the mark. Mr Jones’ condition worsened, but without a clear diagnosis, doctors were powerless to help. They finally suspected a tumour of the pancreas and decided to perform surgery to get to the root of the problem. “They attempted a Whipple procedure, [which is when] they cut the head of the pancreas off, where the tumour is,” Ms Barnes said. “But when they opened him up, the tumour was wrapped around the portal vein, which is a major vein. “They just went, ‘sorry’, and closed him back up. By the time the diagnosis of stage four pancreatic cancer was made, Mr Jones’ stomach was protruding with fluid and his legs were swollen “like tree trunks”. He was reduced to a shell of the uber-active father and grandfather his family loved so dearly. Unfortunately, this tragic tale is all too common. The symptoms of pancreatic cancer are frequently missed and can easily be confused with more benign ailments. This means that chemotherapy and other treatments are often not considered. The disease is generally not diagnosed until a patient is halfway to death. The Cancer Council says signs to look for are weight loss, jaundice, loss of appetite, pain in the upper abdomen, nausea, changed bowel motions, severe back pain and the onset of diabetes. 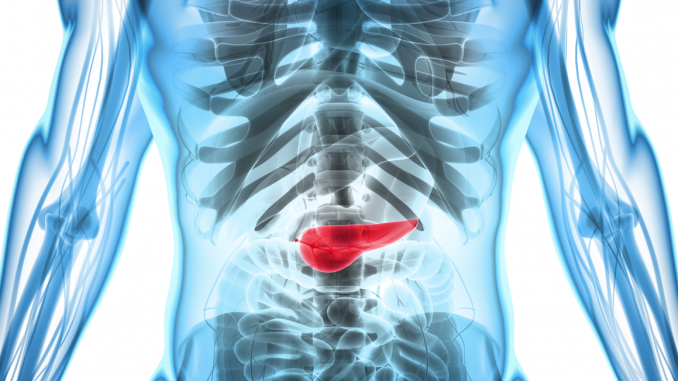 According to the Australian Pancreatic Cancer Genome Initiative, the disease is difficult to detect due to its anatomical location. It is hidden behind other major organs such as the stomach, small intestine, liver, gallbladder and spleen. Symptoms are not often noticed until the cancer is big enough to touch and affect other organs. This staggering lack of understanding is why Ms Barnes felt she had to do something. 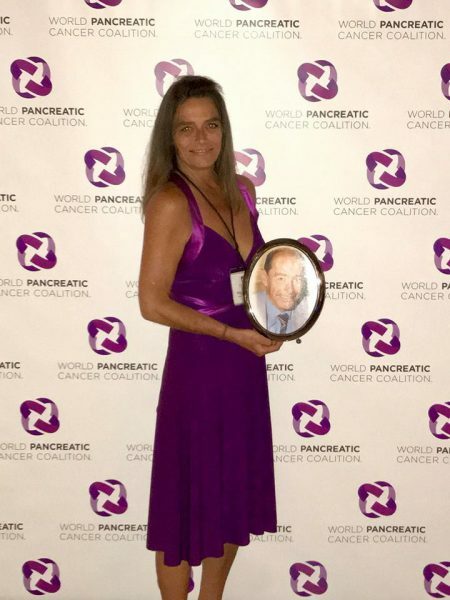 Not wanting others to experience the same emotional pain she did during her father’s death, she began advocating for greater awareness of pancreatic cancer. She started a Facebook page called Pancreatic Cancer Matters, which now has over 4,000 supporters. Most of them have been personally affected by the disease, either suffering themselves or witnessing a family member battle in vain. Many have similar stories to Mr Jones, in that doctors did not diagnose the disease until all they could do was pass on their condolences. In addition to her social media work, Ms Barnes successfully petitioned for the drug Abraxane, which helps extend the life of a pancreatic cancer patient, to be added to the Pharmaceutical Benefits Scheme in 2015. This reduced its cost from $4,000 a script to $6. In recognition of this achievement, she won the Cronulla Woman of the Year award and a NSW Community Service award. Her tireless efforts culminated in an invitation to the World Pancreatic Cancer Coalition Conference in the USA earlier in 2018. It was a trip that provided motivation and hope. “To be in the room full of researchers, full of people that really want to make a difference, was really good. Obviously, you talk to people and their families who say: ‘I wish we’d known about this, I wish we’d known about that drug’. But no one really goes that next step to try and make that difference,” she said. When Ms Barnes started her advocacy work, she was one of the few ambassadors for pancreatic cancer awareness in Australia. Now, a host of other social media pages have joined her crusade, and organisations like the Garvan Institute and the Pancare Foundation are contributing by way of research. Their endeavours are clearly paying off. Since 2009, the five-year survival rate for pancreatic cancer has improved from 3.3 per cent to the current 7.7 per cent. It’s reason to be optimistic. The next big campaign for Megan Barnes and fellow advocates is World Pancreatic Cancer Day. Last year, the Sydney Opera House was turned purple, the colour used to generate awareness of the disease, thanks to Purple Our World – a member of the World Pancreatic Cancer Coalition. Ms Barnes hopes more Australians will get involved in this year’s events, on November 15. While progress has most definitely been made in recent years, the mission of pancreatic cancer awareness and research is only in its infancy. Donations and support are required and appreciated. But if there’s one message Ms Barnes hopes will resonate widely, it’s the importance of recognising the warning signs of this unforgiving disease.